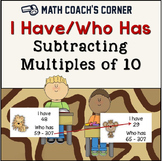 Includes 8 worksheets for 2-digit subtraction of multiples of 10 from multiples of 10, ranging from 0 - 90. 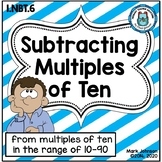 80 problems total. 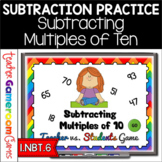 Students must solve for the difference & show their work by drawing & crossing out base ten blocks. 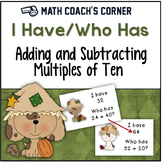 Your children can use these cards and a Candy Land game board to practice adding and subtracting multiples of 10. 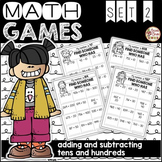 I also included a number grid for children who need additional help. 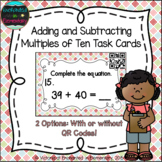 These cards are aligned with common core math standards 1.NBT.4, 1.NBT.5, and 1.NBT.6 for first grade. 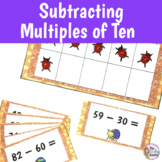 A collection of worksheets to practice adding and subtracting multiples of ten by using base-ten models.